Bev had been wanting some salmon cakes (patties) so we grilled enough fresh salmon for a meal with enough leftover to whip up a batch of cakes the next day. 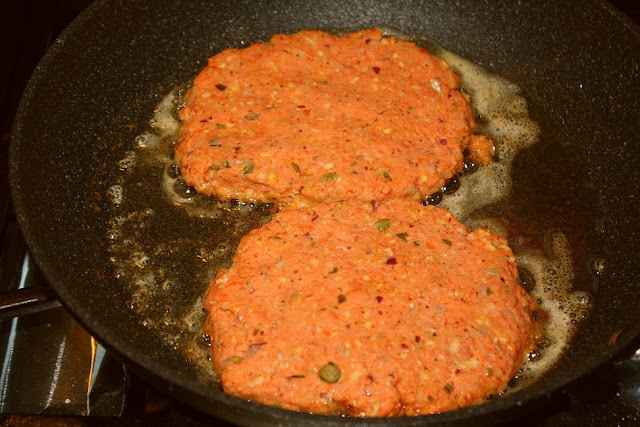 I found several recipes but when Bev said she wanted a salmon burger on some rye bread that she had, I looked up recipes for the burgers to see if they were the same as the cakes. I came across one from Mark Bittman and it had several less ingredients than the cakes. 1. Cut the salmon into large chunks, and put about a quarter of it into the container of a food processor, along with the mustard. Turn the machine on, and let it run -- stopping to scrape down the sides if necessary — until the mixture becomes pasty. 4. Place the butter or oil in a 12-inch nonstick skillet, and turn the heat to medium-high. 5. When the butter foam subsides or the oil is hot, cook the burgers for 2 to 3 minutes a side, turning once. 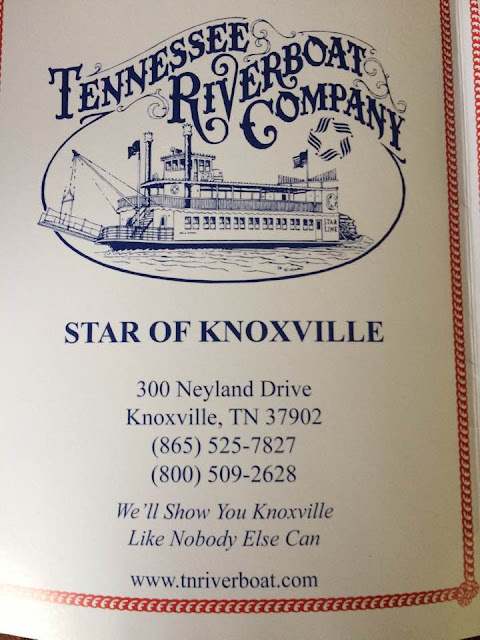 Our Tennessee Travelers Chapter of FMCA (motorhome club) recently had a little summer get-together for a lunch cruise aboard the Star Of Knoxville riverboat - a 325 passenger paddle wheeler. The boat headed downriver from downtown Knoxville for a two hour round trip cruise. 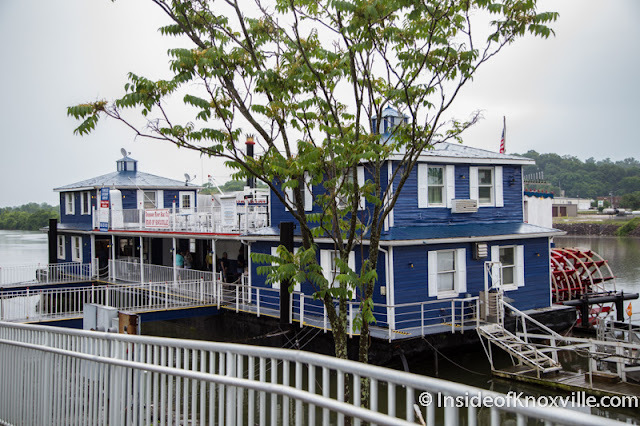 This is the docking area with the boat behind it, then out on the river. I’ve found that I like virtually no bottled salad dressings as most of them seem have this unusual flavor that I call a “wang” that I don’t care for – since so many have it, I assume it might be a preservative. We usually keep a bottle around for when we run-out , but otherwise I prefer homemade or semi-homemade dressings. 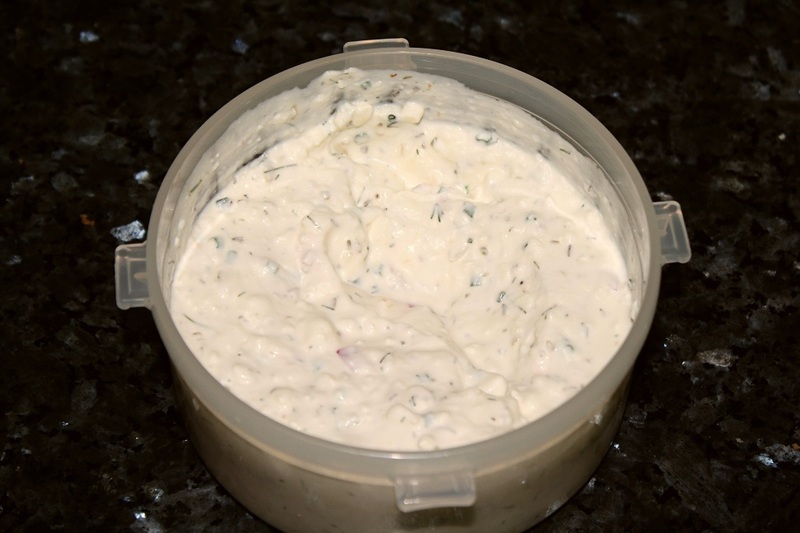 I really like Greek flavors including Feta Cheese on salads and I have always used a vinaigrette with crumbled cheese. Unfortunately for my waistline, I also really like creamy dressings, such as Bleu Cheese, so I went in search of a recipe for a creamy Feta and my search led me to this one from Food.com. 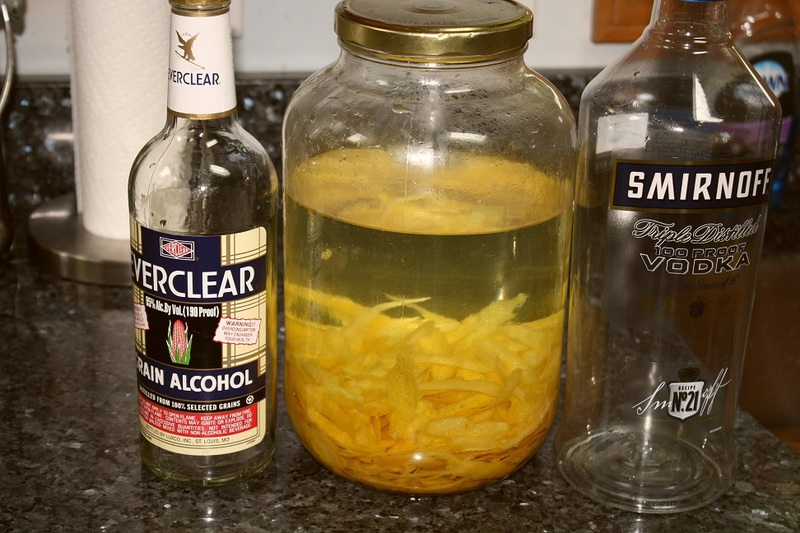 Back in May, I posted about our first batch of limoncello and commented that the next batch would be made with Everclear but I ended up using 100 proof vodka instead and I made a larger batch using 2.5 liters of the liquor and scaled the other ingredients to get this. 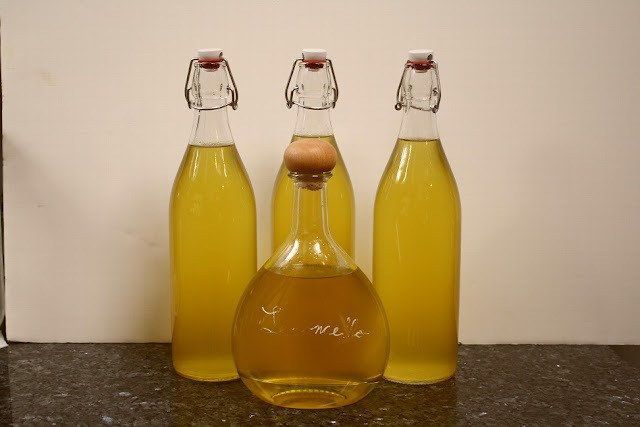 I added everything to a gallon jar and let it macerate for 3 weeks then added the sugar water (it took two containers) and let it set another month before bottling (it was delicious). For our third batch, I used 1.75 liters of vodka and 750ml of Everclear and I look forward to seeing if there are any differences (in about six weeks). If mine looks like it has less lemon peel than others, that's because it contains all of the liquor. Thanks Velva for getting me started with making this. 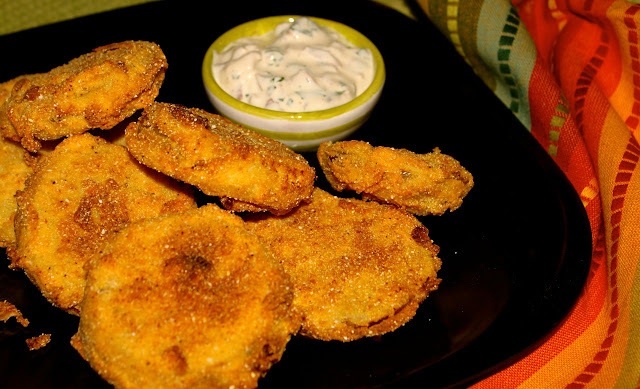 I’ve always loved fried green tomatoes and when I was growing up, my family often had them in simple fashion – sliced about ¼“, S&P, dusted with flour, fried in Crisco, eaten as an open faced sandwich on a slice of white bread. They’ve come a long way since then and are now featured on many restaurant menus as appetizers, side dishes, and sandwiches usually with much more sophisticated coatings than mom’s simple flour. 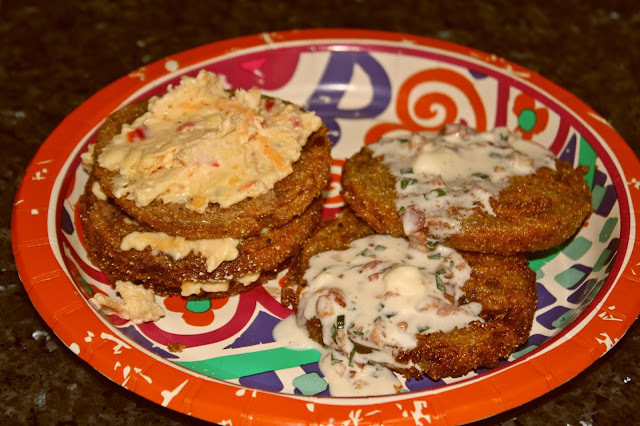 I’ve tried many versions in restaurants and enjoyed most of them but have never been able to create a satisfactory coating at home so I decided to give Roz’s “The Best Fried Green Tomatoes With Garlic, Bacon, And Buttermilk Sauce” a try from her La Bella Vita blog. I won’t reprint the recipe here but encourage you to stop by her blog for the details and some great photos – you really need to see her shots – then you’ll likely be heading to the store to pick up some green tomatoes. I borrowed one of her pics to whet your appetite. Her blog also includes a dipping sauce recipe and a photo of tomatoes stacked with pimento cheese. Since we had some smoked gouda pimento cheese on hand, I opted to try them both ways. The tomatoes were delicious without any toppings so I have found my coating recipe and will make this the go-to version. I deep fried them at 350 degrees but after reading this in Wikipedia – “Shallow frying is preferred, as the tomatoes do not float in the oil, which allows the weight of the tomato to press the cornmeal to the underside of the tomato. This negates the need for a wash” – I’ll still use Roz’s wash but I’ll try pan frying next time to see which I prefer. I followed the sauce recipe as written and next time would make two changes – First, I thought the bacon was a little overwhelming so next time I will use half as much and second, the sauce was overly salty, which may have come from the bacon so next time I will mix and let it set a while then salt to taste. While I enjoyed the pimento cheese stack, I preferred the dipping sauce. 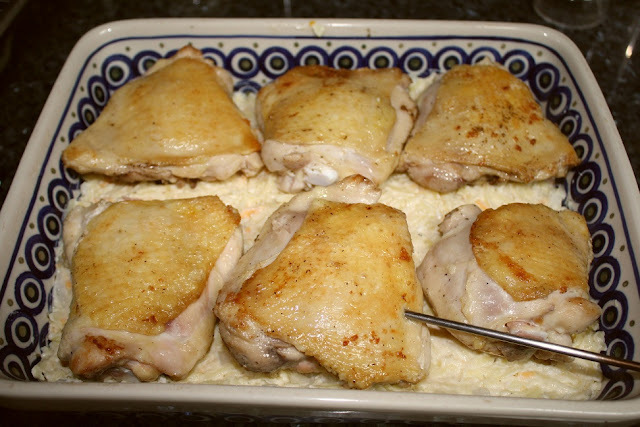 I had a craving for chicken thighs so I picked up a package during a recent store visit and I had saved this recipe from Coupon Cravings which sounded very good, so I decided to marry them and just substitute chicken for the pork chops. 1. Brown the pork chops on both sides in the oil in a pan and drain on paper towels. 2. Combine all other ingredients (hash browns last) and spread in a 9x13 baking dish. 3. Top with browned chicken (mine could have cooked a little longer). All-in-all, I think it was a great visit and everyone seemed to have a fine time, some are already looking forward to next year. 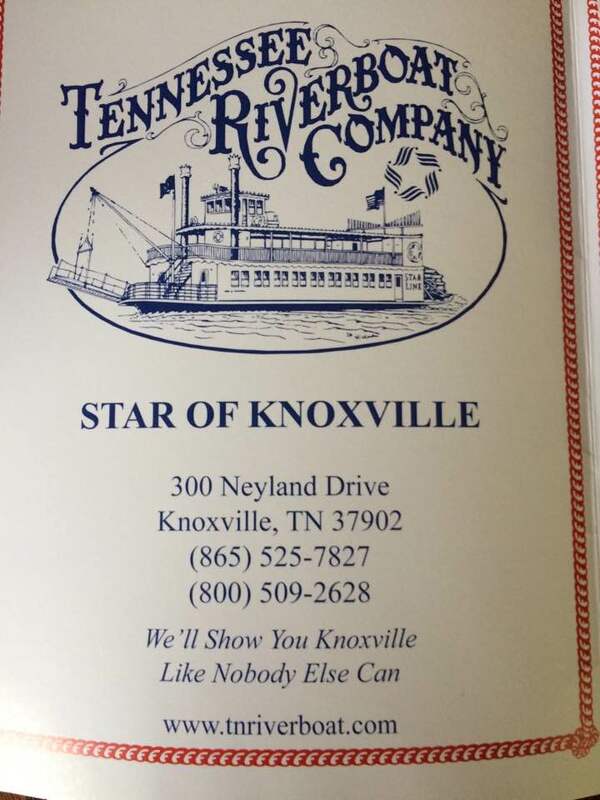 From a food standpoint, we had the low country boil, hot dogs & Dutch oven fried potatoes (a Kathy must), Lasagna, Sloppy Joes, scrambled eggs (a Matthew must), pancakes, and French toast casserole. 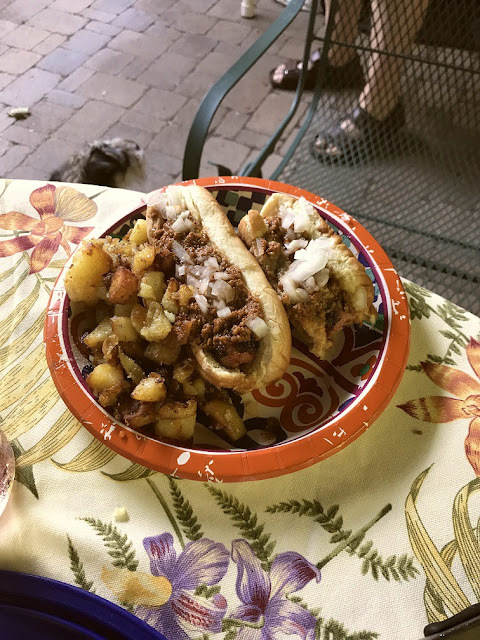 Here is my hot dog plate – grilled wieners, homemade hot dog sauce, potatoes fried is a large cast iron pot. 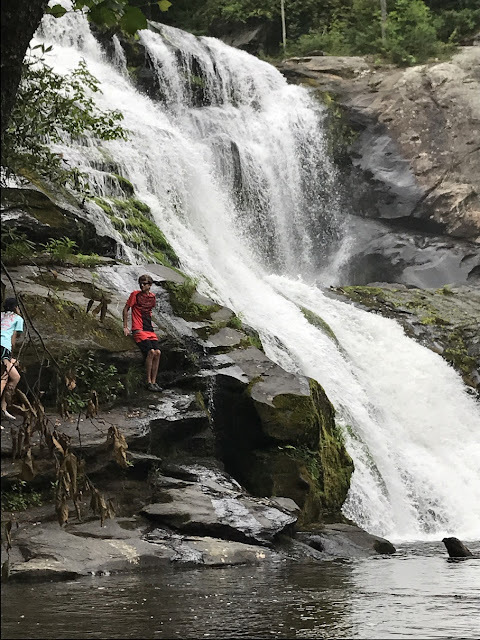 In addition to playing on the lake, the kids did several off-site things while here, beginning with a visit to Bald River Falls in the Cherokee National Forest near Tellico Plains, TN. Only part of the gang went and they got to see some good water coming over the falls and play in the pool at the bottom. Our good friends Carol and Joe are big time Karaoke fans and have a real set up for doing it including some big speakers and hundreds of fully cataloged songs on CD’s. 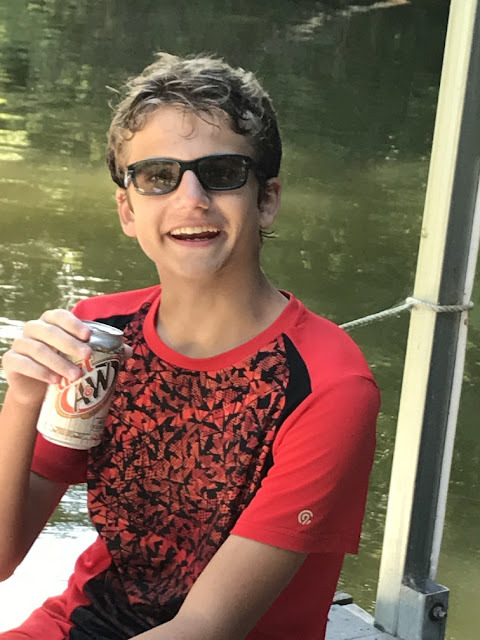 Since many of our family are singers, we decide it would make for a good activity following the Low Country Boil on the dock and as I found out later several of them were expecting a boring evening. As is usually the case, folks are reluctant to get up to the mic but since I’m the worst singer in the group and don’t worry about what they think, I went first with brave granddaughter Katelyn. Here is a shot of the audience with several looking through the song lists. Our Texas (Roden’s) and Illinois (Doolittle’s) families came in for their annual lake visit and they were joined by two of the Walker (South Carolina) kids and the two older grandkid’s boy friend’s for a total of nine kids ages 10 thru 20 and three adults – had Madison been able to come, all eight of the grands would have been together for the first time in I can’t remember when. All twelve of them slept here along with Cindy and us so we had the RV and beds full plus several on couches and recliners but they found a way to make it work. 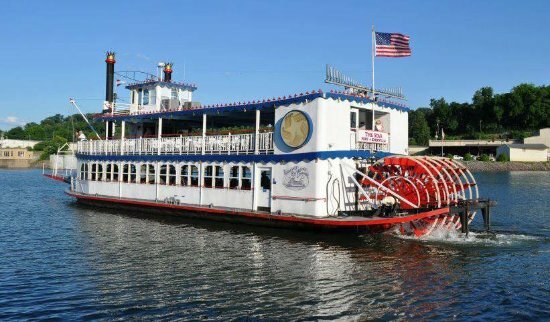 In addition to being with each other, the main purpose of the visit is to play at the lake, especially riding a tube behind the jet ski. Here are some shots of them in action.